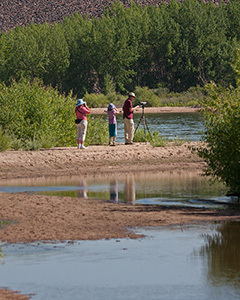 Chatfield State Park offers residents of metropolitan Denver a convenient place to experience the natural world. 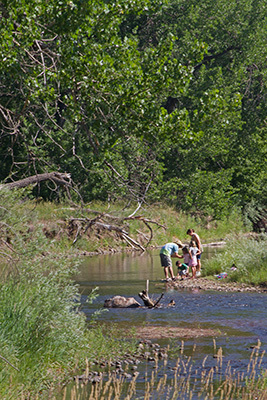 The Chatfield Reallocation Project would destroy the habitat that this family is enjoying along this section of the South Platte River. 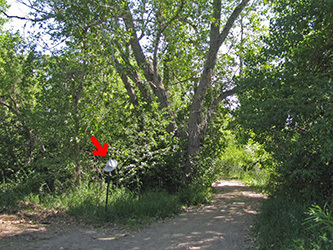 The Reallocation Project would inundate 587 acres of land in Chatfield State Park, including the land behind this post, which is located near the South Platte River approximately 0.69 miles upstream from the current edge of Chatfield Reservoir. About a third of the section of river flowing within Chatfield State Park would be directly affected by the change. People now use the land that would be inundated for activities such as horseback riding, bicycling, hiking, and jogging. 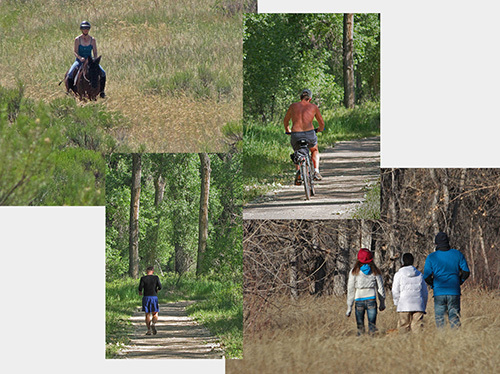 An extensive network of social trails indicates that some sections of the Park are already overused for these activities. Removing 587 acres can only make the situation worse. The DEIS mentions in several places the increase in fish habitat and benefits for anglers who use boats, ice and the shore of the reservoir. There is little emphasis on the losses to fishermen who prefer to fish along rivers. 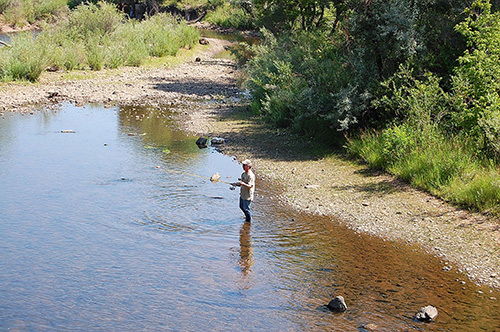 The place where this man is fishing on the South Platte River would be flooded when water is high and surrounded by mudflats when water is low. According to the U.S. Fish and Wildlife Service’s 2006 Survey of Colorado Wildlife-associated Recreation (the most recent available data), 1,800,000 people participated in wildlife watching in Colorado that year, spending a total of $1,388 million. Yet, the DEIS gives little attention to mitigating the lost opportunities for wildlife watchers, and to both the probable loss of non-Theatened wildlife species and the absolute number of watchable wild animals within the Park. Preservation of wildlife inside the Park is especially important because ongoing residential development outside the Park will reduce other opportunities to watch wildlife along the Front Range. This family is watching birds near the mouth of Plum Creek, an area where vegetation would be removed by the Reallocation Project. The Chatfield swim beach was heavily used on Sunday afternoon, July 22, 2012. Trees in the area of the swim beach sheltered as many people as could fit under them on this hot July afternoon. 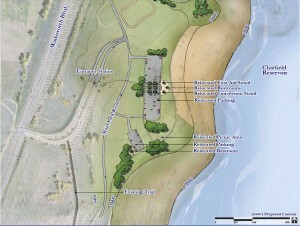 The Chatfield Reallocation would inundate the concession stand, restrooms, and parking area at the current Swim Beach. 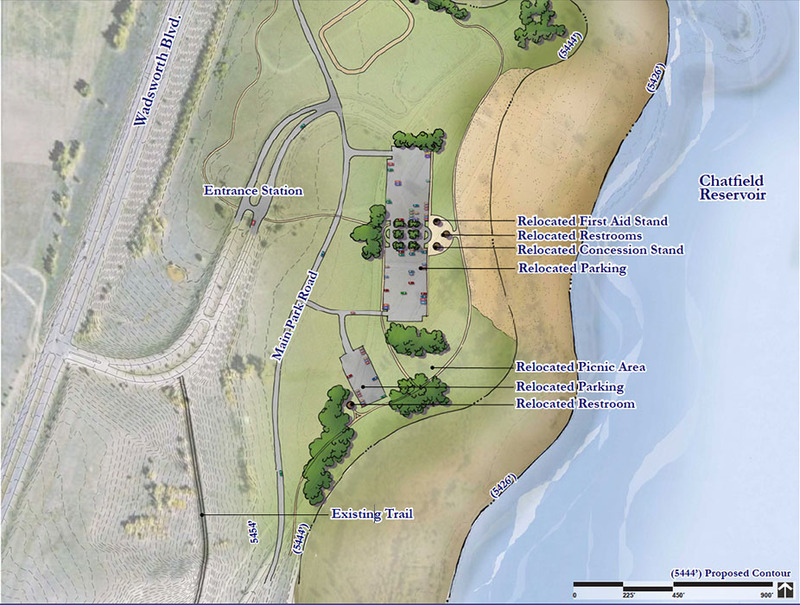 Facilities relocated to higher ground would be considerably farther from the shore at low water levels, and trees in this area would die or be removed and replaced with younger ones. Water levels in Chatfield Reservoir, which currently fluctuate by 9 feet, would be expected to fluctuate by 21 feet. The target water level of 5444 feet above mean sea level would be attained in only 18% of years (DEIS, Table 2-9). Typical water levels in the reservoir would be considerably lower than the target level. The mature trees near the beach would no longer offer their generous shade to hot beach goers. Some new trees will be planted, but it will take years for them to reach the size of currently available trees. And they will be 600 feet or more from the shore. The map below shows the Swim Beach at the relatively low water level of 5426 feet above mean sea level. At this level the shortest distance between the shore line and the restrooms would be approximately 600 feet with an elevation gain of 21 feet — a long way to walk for someone with an urgent need! Chatfield State Park Swim Beach at a relatively low water level (DEIS, Appendix M, page 3-9). Please click map to view a larger image. Higher target water levels would necessitate moving parking lots to higher ground. When water levels are low (at times as much as 21 vertical feet below target levels), people using hand-launched boats like canoes and kayaks would have to carry their crafts much further before they could launch them. Today much of Chatfield Reservoir is surrounded by riparian forests. During periods of low water levels, boaters would view mudflats where these forests now stand — hardly something which would enhance their outdoor experiences. 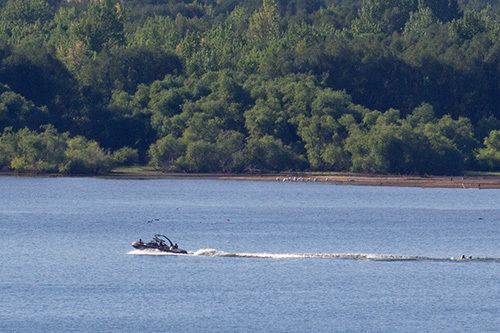 A power boat and a down water skier near the mouth of Plum Creek in Chatfield Reservoir. All the trees in the background would be destroyed by the Reallocation Project. The forested area would be flooded at times of high water. Much of the time it would be exposed as mudflats. Existing picnicking facilities at Massey Draw, Deer Creek, the Swim Beach, Jamison Day Use Area, Catfish Flats Day Use Area, Fox Run Day Use Area, Kingfisher Day Use Area, the Marina Area, and Plum Creek would all be inundated by the Reallocation Project. In most cases, mitigation plans call for developing alternative picnic areas on higher ground. 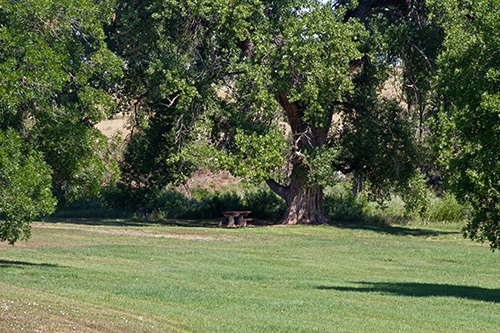 Mature trees in existing picnic areas would be lost. Picnic tables would bake in the sun until shade trees can be established in the alternative areas. The Deer Creek is one of the picnic areas that would have to be moved to a higher site because of flooding associated with the Reallocation Project. Mature shade trees like the one sheltering the picnic table in the center of this picture would be destroyed. Trees like this would take decades to grow in an alternative area.